Longest day (122 k ms), with the toughest climb, oddly enough called, Mount Paul. But, it was also a day of varied terrain (a meandering singletrack alongside a river in the forest, jolting over bumpy grassy meadows, drafting in groups on wide gravel farm roads, just centimeters from another riders back wheel. But, the highlight was the end. And it is here that I will begin. Leaving the riverside singletrack, you’re spit out onto a scene of rolling hills with the Drakensberg Mountains suddenly visible way in the background. They remind me of the top of a castle turret (yes, there is a name for the architecture but for the life of me I can’t find it). The climb up Mount Paul is a 7 km gradual singletrack switchback up and around the flat-topped mountain. We got ahead of a guy and the three of us started the ascent. Turns out this man is recovering from lung cancer: he just finished chemo and this was his first race since. Paul raced up, as he is a genetic freak, and I lead the guy up. We didn’t say anything, but I could hear his heavy breathing behind me. That he is in this race after cancer is remarkable. And what a way to celebrate his health, his life. Earlier in the day, I also cycled alongside a woman for a bit who revealed that her brother was recently shot. What? “You come to appreciate that nothing lasts. Everything is fleeting. But riding always puts things in perspective for me. Look at this place,” she says. Indeed. 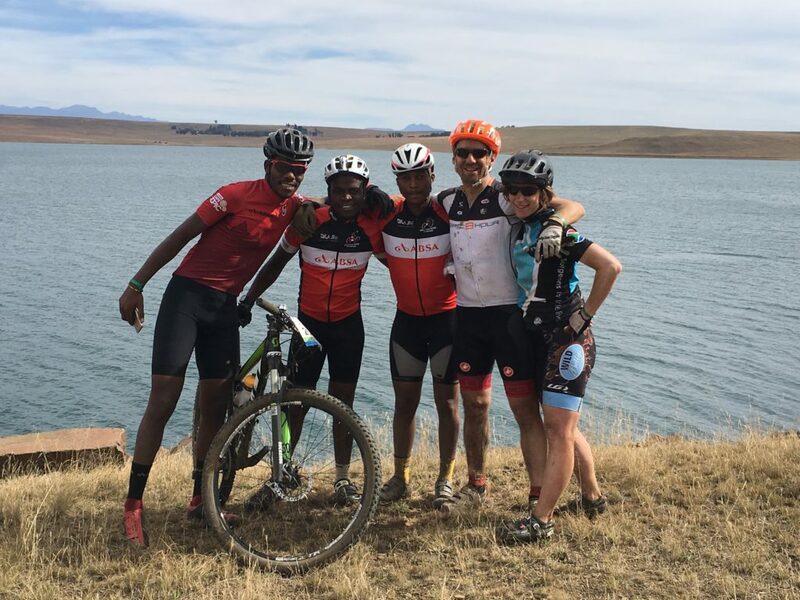 For the last few kilometres, the trail was actually on top of a dam wall, the Sterkfontein Dam, which is normally closed to the public. Much of this land is private so you can imagine the organisation to access. It’s also an incredible chance to cross land that most travellers won’t ever see. We began riding behind a team of South African boys. Paul was riding behind one of the guys yesterday and noticed his seat was too high and offered to fix it after the race. Today, it was the cutest thing: Paul and the kid raced each other up a hill. After the ride, Paul fixed his handlebar. Here is a picture of us all close to the finish line overlooking the dam. Riding with some amazing people, and being here with Paul, it’s a good reminder: love makes us stronger.